If you actually needed another reason to visit the New Paltz Water Street Market, you now have one. The market is located on the western edge of the village of New Paltz, overlooking the Wallkill River Bridge. The Rail Trail passes alongside the entrance to the market, adding a constantly changing stream of bikers and hikers to this picture perfect setting. It is a setting that I dream will someday spring up along the WalkWay / Rail Trail in the City of Poughkeepsie. The market is an eclectic collection of cafes and shops (think Woodstock), including one of my favorites – The Cheese Plate. 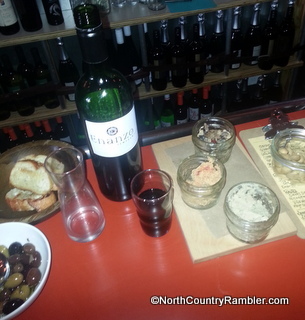 There is a tiny space next door to the Cheese Plate that is now occupied by the Jar’d Wine Pub. 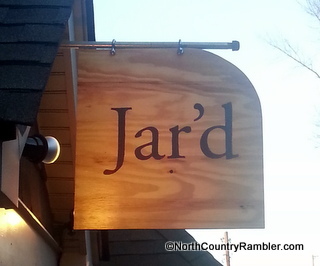 Jar’d’s proprietor is a legendary New Paltz publican, one Theresa Fall, who up until this venture could be found behind the stick at Il Gallo Giallo and the now shuttered 36 Main. Jar’d is as cozy as cozy gets. You can fit eight people at the bar as long as no one is reading the Times, and there are three deuces along the wall for “overflow”. You literally have to go outside to use the bathroom. A patio overlooking the river will be open this summer and will provide additional seating. (I predict she will need this additional seating.) There is no actual kitchen, so the menu focuses on small plate “tapas” offerings that can be served without any in house prep. When we stopped in with the boys last Wednesday to check the place out (she opened just two weeks ago) we found more than enough on the menu to construct a nice communal meal. We had five in our group, so we ordered two of each of the eleven menu choices, along with a red and white to wash it all down. The wine list offered a few selections of inexpensive Spanish and Italian “bistro” wines. We tried a bottle of Enanzo Tempranillo ($8 / $27), and a Sietes Verdejo ($7 / $24). Theresa started the parade of appetizers with bowls of cured olives, humus, Marcona almonds ($4), chicken liver pate ($9) a mousse of white bonita ($8) and baskets of sesame flat bread and sliced baguette. A crock of D’Artagnan’s duck rillette ($9) was my favorite dish. We all enjoyed the Spanish pub classic, “boquerones” – salt cured anchovies bleached in vinegar ($9), which went perfectly with the traditional accompaniment – some rustic fried chips ($4). We found room for a plate of charcuterie ($13), which included slices of cured Serrano ham, a French style dried sausage – saucisson sec – and a dried Spanish chorizo. We finished with plates of bleu cheese and fig cakes – a perfect ending to a very nice meal. Theresa has all of the wine and menu offerings up on the pub’s Facebook Page.